As a registered dietitian, I consider it my duty and privilege to continually learn and grow in the always-evolving field of nutrition and health. This means that my nutrition practice changes over time - as it should. Most recently, I have been immersing myself in two different - but often overlapping - eating models created by well-respected dietitians. The first is called the Eating Competence model, and was developed by Ellyn Satter, MS, RD, LCSW, BCD. The second is the Intuitive Eating model, developed by Evelyn Tribole, MS, RD and Elyse Resch, MS, RD, FADA. The websites that I’ve linked above provide an excellent introduction to each of the models. I’ve also been learning a huge amount from Satter’s book, “Secrets of Feeding a Healthy Family” and Tribole and Resch’s “Intuitive Eating Workbook”. 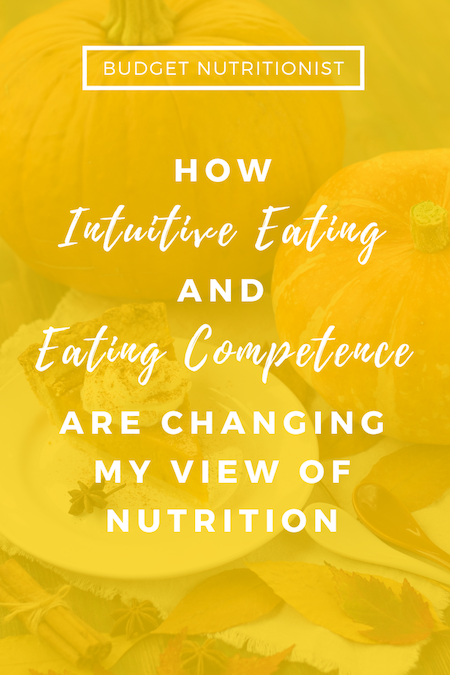 In addition, I have been learning about the nuances of practicing Intuitive Eating in a clinical setting from the Nutrition Matters podcast, by Paige Smathers, RDN. I highly recommend checking out any of the above resources if you want to learn more about either of these models. My own nutrition perspective practice has been heavily influenced recently by both models, but more so by the Eating Competence model. 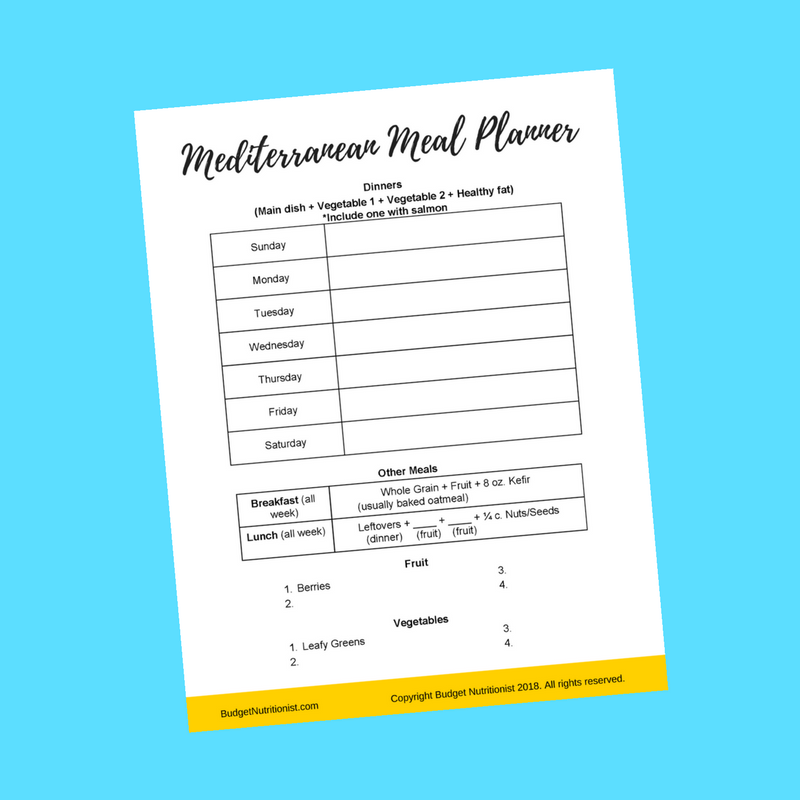 I still strongly support a Mediterranean eating pattern for overall health and wellness, but my method of practicing and promoting it is shifting to be more flexible and pleasure-driven, as you’ll see below. Prioritize consistent, loosely-scheduled meals first - and snacks if needed - before considering specific foods or nutrients. I’m learning that this is the cornerstone and number one most important key to eating well. If we don’t prioritize fairly consistent meals - meaning we eat at least every 4-5 hours - nutrition eventually goes out the window. If we’re ravenously hungry, chances are high that we’re going to reach for the candy bar - or the whole bag of candy. This is because the body goes into a state of confusion when we let ourselves get too hungry. It wonders where the next fuel source is going to come from, or if it’s coming at all! This causes us to reach for high-calorie foods with very little concern for nutritional value when we finally do get around to eating. It also causes us to eat more quickly and frantically than we otherwise would, which often leads to overeating. For me, this commonly looks like rummaging around my kitchen cabinets for something - anything - good to eat when I get home from work if I haven’t had a satisfying afternoon snack that day. Morning, afternoon, and evening meals every. single. day. plus consistent snacks in between as needed. My lunch and dinner are more than 5 hours apart, so I need an afternoon snack to feel satisfied and have sustained energy in between. This provides the freedom to thoroughly enjoy eating and to forget about it in between, simply because we know that our next opportunity to eat is coming at a predictable time and that we won’t let ourselves get too hungry. Next, prioritize eating in an undistracted environment. Eating is one of the most basic forms of self-care. It is a required daily activity for life that is also pleasant and a time to recharge and take a break from your day - but only if you let it be this way. Too many of us eat at our desk at work or while watching a show or browsing social media. This robs us of the rejuvenation of a focused meal. Ellyn Satter explained in her book, “Secrets of Feeding a Healthy Family”, that eating can be almost meditative if it is done in a focused manner. Meditation is simply being in the moment and fully noticing the sensations we are experiencing. I’d say eating fits that definition nicely - as long as we are paying attention to our food instead of something else. I wonder when eating became a secondary activity in our culture? When did it stop being enough to just sit and eat your lunch? Now, you have to be driving, working, checking your phone, or watching a show while you’re eating or it feels like a nuisance getting in the way of living. I think it might be due to our culture of busyness. Or maybe it’s our tendency to avoid silence and aloneness. Whatever the reason may be, I believe that our physical and mental health has suffered as a result. When we eat while distracted by something, that “something” drowns out our bodies’ cues telling us that the food is pleasurable or that we’ve had enough. This leads to overeating. I’ve personally found that if I’m doing something while eating, I often clean my plate and look down, shocked to see nothing left and a little disappointed and sad that my meal is already over. Sometimes this leads me to get seconds - simply because I haven’t had enough of the experience of eating yet. Maybe if I paid full attention to my food, I would be satisfied. Third, prioritize eating foods you enjoy. One of the most mind-blowing things I’ve learned from reading “Secrets of Feeding a Healthy Family” is that we actually absorb more nutrients from foods we enjoy. Ellyn Satter described a few different studies in which participants were given appealing food or less appealing food with the same nutritional value. In each study, the participants absorbed more nutrients from the appealing food. This was explained as likely the result of what’s called the cephalic phase of digestion. The cephalic phase of digestion is when you anticipate food. Your mouth may start to water, or you may just start thinking about the food that’s in your near future. As a result, your brain sends a signal to your stomach to start pumping out digestive juices to get ready for the food that’s on its way. If a food isn’t that appealing, the cephalic phase of digestion may be short-changed. If you’re not anticipating eating because your food isn’t particularly yummy, your digestive juices may not be kick-started ahead of time, and your mouth certainly isn’t going to water! This results in reduced absorption of nutrients. I don’t know about you, but this is mind-blowing for me. You can read more about it in Satter’s book, “Secrets of Feeding a Healthy Family”. Another reason to eat foods you enjoy is simply because you enjoy them! Eating is one of the simple joys of life, and it’s a shame to miss out on this joy because you’re trying to “get healthy”. I’m convinced that if God didn’t intend for food to be enjoyable, there would only be one food in existence and it would contain all of the nutrients we need. Instead, God created a huge variety of plants and animals that are suitable for eating, and which come in a vast variety of colors, flavors, shapes, and textures. To me, this says that eating was intended to be fun! Eat amounts of food that are satisfying for you and don’t follow external portion control or calorie counting rules in order to do so. I’m learning more about how our bodies can be trusted, meaning that we will eat the amount of food that is right for us as long as we combine consistent, undistracted meals with full permission to eat. This means firing the food police. It also means leaning hard into the first and second priorities - consistent meals and snacks and undistracted eating environments. Structured meals and undistracted eating are crucial for allowing our bodies to do their thing in regulating how much food we eat. By eating at consistent times and avoiding going too long without food, our bodies will never feel alarmingly hungry. This means that we will avoid that ravenous feeling that so often leads to overeating and feeling out of control. By eating in an undistracted environment and paying attention while we eat, we will automatically be tuning in to what our bodies are trying to say about our level of satisfaction and will stop when we’re ready. This could be when we’re full OR when we’re done enjoying the taste of the food and the experience of eating. This doesn’t doesn’t mean that we will lose weight (I’ve been learning more about weight loss dieting, which I’ll share below), but it does typically lead to weight stabilization over time. No more yo-yo-ing! Yay!! Next, strive for balance by including at least a few key food groups in most meals. This is where what the intuitive eating community would call “gentle nutrition” comes in. Gentle nutrition is paying attention to the “what” of eating, but in a way that is not rigid, fits in with your preferences and lifestyle, and does not produce guilt! Anything extra in addition to these (i.e. an extra vegetable/fruit, starch, or protein) is extra credit. :) The starch or grain component provides energy-filled carbohydrates to keep your blood sugar steady and provide the preferred fuel source for your body. If you choose whole grains, they will also provide fiber, which promotes a healthy digestive system and supports our body’s natural detoxification process. Protein provides fresh building blocks for nearly every single part of the body. This is important because your body is constantly rebuilding and regenerating various parts, and it requires adequate protein to get the job done. Fruit and vegetables provide carbohydrates and are loaded with various vitamins, minerals, and fiber. Protein and starch foods provide vitamins and minerals as well. Fat is an essential component of our cell membranes, brain tissue, and skin, just to name a few. It also helps us absorb certain vitamins and provides staying power to a meal so our energy level is sustained until we eat again. As you can see, there is no singular “star” of the nutrition show! All of the food groups work together like an orchestra to keep our bodies humming along. A balanced overall eating pattern is what matters, not one meal or snack. Add nutritious foods in ways that taste good, rather than restricting and taking “bad” foods away. This is another aspect of what some call “gentle nutrition”. Ultimately, humans don’t respond all that well to rules telling us what we can’t do. This is because “don’t eat ____” and “eat less ____” are a direct threat to our individual autonomy, which is one of our most cherished human rights. Nobody likes being told what not to do. It’s just not fun. Instead, I’m learning to focus more on the positive side of nutrition, which is adding nutritious foods to balance my diet in ways that taste good and don’t rob me of the joy of eating. This is why I’m such a huge fan of fruit and vegetable dips and why I’m not the least bit afraid of salt, sugar, or fat if it makes nutritious foods more delicious! In the end, we’re not going to frequently eat things that don’t taste good to us. If we try, we are fighting a losing battle. Does this mean that we’re doomed to dislike Brussels sprouts, broccoli, etc. forever? Nope! It just means that if we would like to make these foods a regular part of our diet, we need to get a little creative with them in order to make them actually taste good. For example, I used to hate them, but now I LOVE Brussels sprouts drizzled with balsamic vinegar and honey, then roasted in the oven until crispy and caramelized. My husband normally isn’t a fan of steamed broccoli, but he genuinely enjoys frozen broccoli tossed with olive oil then roasted in the oven until tender and slightly crispy, and topped with our favorite steak seasoning. One of the big revelations that’s changing my life as a dietitian and nutrition nerd is that research doesn’t have much - if anything - to show that long-term weight loss is possible. In the extremely rare case that long-term weight loss is achieved and maintained, it involves dramatic and very unhealthy measures. The first principle of Intuitive Eating is to reject the dieting mentality for this reason. If weight loss dieting doesn’t work, then we are wasting our precious time, energy, emotion, and money on it. Life is too short for this! It’s time to go a different direction. I believe that we should pursue eating that not only meets our physical needs, but also brings us pleasure and joy, and connects us to the people we care about. I believe that if God intended for food to only be treated as “fuel” or “medicine”, he would have created just one food that contained all of the protein, carbohydrates, fat, fiber, vitamins, and minerals we need. That food would be bland and would have only one color and texture. The variety of food available to us is staggering! 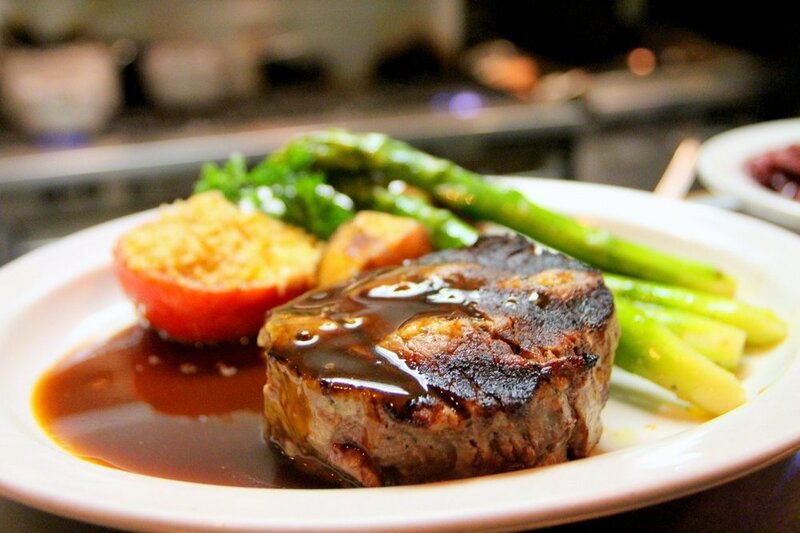 Food comes in every texture imaginable: juicy, crunchy, mushy, tender, smooth, soft, creamy… The list goes on and on! 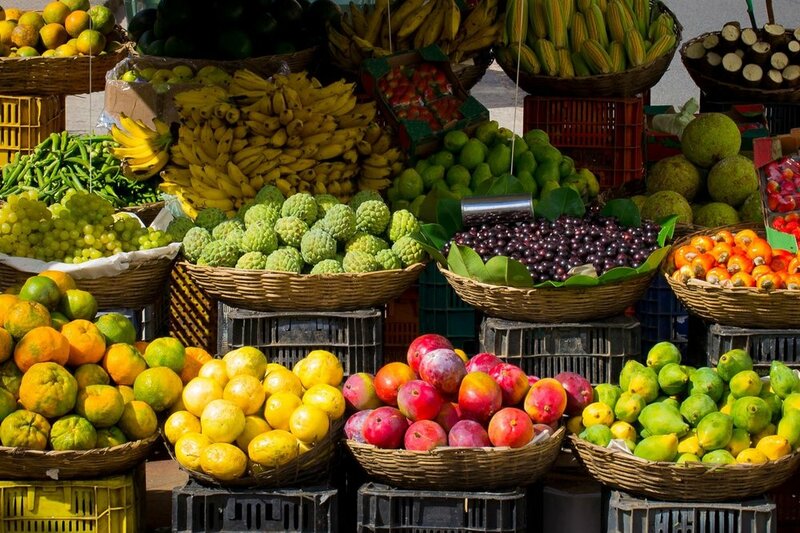 And then there’s color: red, yellow, pink, white, blue, green, purple, black, brown, orange… What’s more, many foods combine two or more different colors! The variety of food available for our enjoyment is tremendous! It’s becoming ever clearer to me that eating should be done for pleasure as well as for health. It is being able to choose food you enjoy and eat it and truly get enough of it – not just stop eating because you think you should. Normal eating is giving yourself permission to eat sometimes because you are happy, sad or bored, or just because it feels good. Normal eating is overeating at times, feeling stuffed and uncomfortable. And it can be undereating at times and wishing you had more. Normal eating is trusting your body to make up for your mistakes in eating. Normal eating takes up some of your time and attention, but keeps its place as only one important area of your life. I feel that it’s time to start “trusting our bodies”, as the Eating Competence and Intuitive Eating models encourage. God made our bodies to more or less instinctively eat the types and amounts of food that we need to thrive. Our bodies are meant to be different shapes and sizes, just as our hair and faces are meant to look different. Working against the way we were created leads to lost time, money, and joy. As you can see, a lot has been going on lately in the dietitian mind of Emily. :) I hope these thoughts are helpful to you. My ultimate goal with this blog is to share my journey in nutrition, budgeting, and health as a registered dietitian nutritionist, personal finance nerd, food-lover, and regular, ordinary person. I recognize that in most ways, my quest for health isn’t any different than anyone else’s. I’m just an ordinary person trying to figure out how to live well and thrive. At the same time, I realize that I have been privileged and blessed with formal education in the field of nutrition and health, and that this gives me a unique perspective as well as the responsibility to share the benefits of this privilege in any way that I can to help make the world a little better place. My hope is that this blog resonates with you and provides you with some small glimmer of insight that will help you on your own journey with nutrition, budgeting, and health. Now that you know more about how I’ve been changing and growing lately, I would love to hear about your journey, too! Comment below and share about your journey with nutrition and health. How have your views on nutrition and food changed over time?